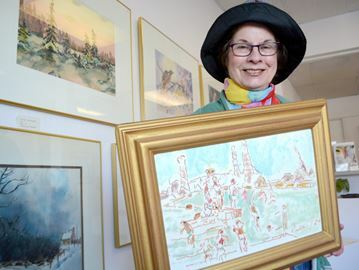 PORT COLBORNE — Arts Place is taking a look back at the matriarchs of art in the city. The artist-run cooperative gallery kicked off an exhibit of works by Madelaine Fregren and Mary Prittie last week. The exhibits celebrates two of the gallery’s founding members and cornerstones of the Port Colborne art community up until May 29. “They are the matriarchs of the art scene in Port Colborne,” said gallery coordinator Joyce Honsberger. Fregren, who now lives in Oakville, was known for her effortless watercolours of still life scenes ranging from birds to landscapes to floral depictions. Prittie, who passed away in 1999, exhibited extensively throughout southern Ontario and was recognized for her unique colour harmonies, feathery drawing and bold depections in oils, watercolour, batik, ink and charcoal. Honsberger recalled Prittie, never one to work from photos, often painted on site, usually in her car. She remembers Prittie choosing a new vehicle based on how the dashboard would allow her to paint. “They were really bright lights,’ said Honsberger, noting both taught with a contagious enthusiasm in the city. “They had this buoyant spirit,” she said. On opening reception will be held this Saturday, May 7, from 2 p.m. to 4 p.m. The gallery is located at 714 King St. and is open from noon to 4:30 p.m., Thursday through Sunday. Steve Henschel is a reporter and award-winning photographer covering the communities of Welland, Pelham, Port Colborne and Wainfleet for Niagara This Week in addition to contributing to Niagara Life magazine. He has a passion for telling the stories of those living in south Niagara and hopes to one day take life seriously. Follow him on Twitter.